I selected three: a Drosera spatulata, the spoon-leaved sundew; Drosera capensis, commonly known as the Cape sundew; and Nepenthes alata, a tropical pitcher plant. Since constant moisture is key to keeping these plants happy, I potted them up in a few metal pots from the seed starting tray I ordered from Gardener's Supply last September (written about here) and put them on a dish with pebbles. The little pots are open on the bottom, so they can soak up water, plus—since I keep plenty of water in the dish—the humidity is higher for them too. Hence the pitchers on the Nepenthes are staying happy and not drying out. I was a little bummed to see some of what I thought were insects on the Drosera capensis, were actually just pieces of soil or other debris. I hadn't been able to tell with just my eye, the camera provided a nice close-up. I think at least one of those below is a fruit fly though...or was. Wouldn't it be fabulous of they had a fly-swatter like action when flying creatures buzzed by? I wonder if they do sort of close up a bit around an unsuspecting insect? Like a Dionaea muscipula (Venus fly trap) would. There is nothing like red/green color combos — especially when each color is a bit unusual. 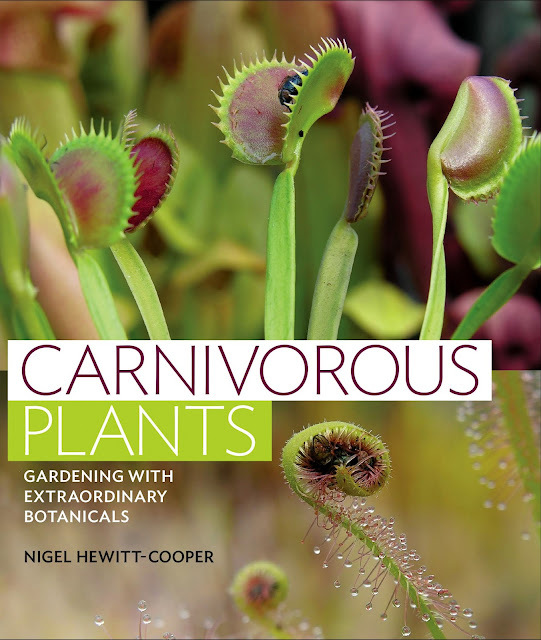 Love all those plants and may have to get the book. I tried some hardy ones years ago and it may be time to try again. I'm just into the book but I'm really liking it. I feel like I've got the hardy ones figured out, but these tropical ones are all new! I really like the Droseras and have been tempted to try one now that carnivorous plants are becoming more available in local garden centers. I hesitate mainly because I fear they wouldn't last long. Wind is a constant drying factor outside and I'm terrible about watering my indoor plants on anything close to a regular schedule. OH don't get me started on the wind! It's been insane here the last few days. The cold air is bad enough, add in the wind and there's no moisture left in anything, esp. my skin! Dangerous indeed, especially if you're a flying insect. Are we witnessing the birth of a new plant passion? It's like being there when you got your first agave. The plants are cool and your presentation is, as always, amazing. Well this one's been brewing for awhile. I've got quite the Sarracenia and Darlingtonia californica thing going on already, but as my collection expands I figured I probably should up my game, knowledge-wise. How do you keep them fed in the winter when insects are hard to find? Or maybe it's mild enough there that you have some around year-round? We do have some insects year round. These are in the basement, but there are still a few pesky things in the air. Plus they don't need to eat all that often. You'll want to watch-out for that flowering Drosera capensis. I see it has a flower stem up. They can seed prolifically into neighboring pots, and while it may seem novel to have a weedy carnivorous plant, it will probably come back to bite you (ha!). Also, that bug is probably a fungus gnat - they love wet peat moss. Excellent warning, thank you. I see that in nurseries, where there are babies popping up here and there (and I've seen a few hitchhikers in with Sarracenia I've bought). Fungus gnat, yes, of course! A charming trio - your photos are excellent, showing the details. Beautifully presented! Thank you for this warning, I've got a lot to learn! I was going off my success with boggy Sarracenia and the fact that when I've seen these in nurseries they're usually sitting in trays with an inch or two of water. I really want to try some Nepenthes. The tiny pitchers on yours are so cute. There were several at the Portland Nursery houseplant sale (larger ones), but their pitchers were all dried up. Not a good look.